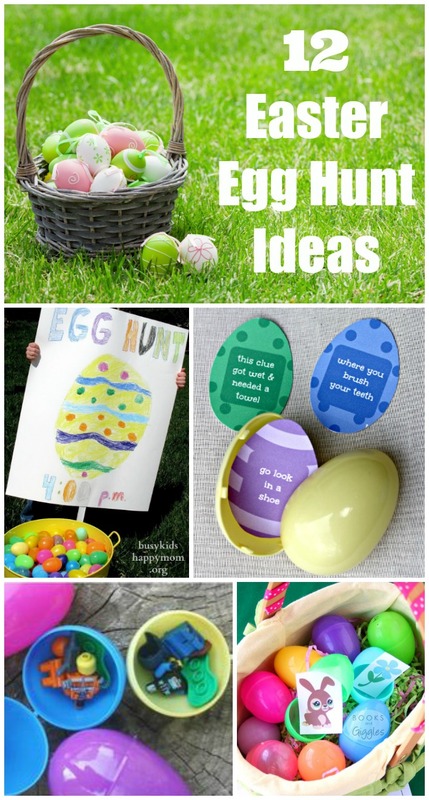 These indoor and outdoor Easter Egg Hunt ideas are sure to please kids of all ages (toddlers, preschoolers, big kids, tweens & teens) -- heck, even adults will enjoy a few of these! I grew up in Central New York which means that snow & cold on Easter was a fairly common thing. My Mom always let us choose special Easter outfits or wear our Spring clothes for the holiday. But a pretty yellow dress paired with ugly black snow boots and a big, puffy coat never said “Spring” to me. Even during a year with a late Easter, there was always the possibility of freezing temps on Easter morning and many times, snow on the ground so our Easter Egg Hunts were held inside. I had seen outdoor egg hunts on television but it was never something that happened in our neck of the woods. When I got married and moved to a climate with a lot less snow, I quickly learned that having an outdoor Egg Hunt was a definite possibility! My husband was not as exuberant as I was about the idea. Cool, I said, not cold. And we can put on jackets before going outside. He was still a little doubtful so I compromised – I would hide 6 eggs inside and 6 eggs outside before we went to bed. Hon, I said, it’s only 6 eggs. We’ll probably be out there for all of 5 minutes to find them. And I’ll put them in plain sight – really, it’s going to be fine. I will say it was kinda fine. When my son spotted one of the eggs out the window, he was pretty excited which made me even MORE excited. We grabbed our jackets and headed outside where he snatched up the first egg. The dog also followed us out the door and quickly found the second egg – and if you don’t have dogs, you need to know that chocolate is not good for them. So we had to chase down the pup since we didn’t know if the dog-napped egg contained chocolate or jelly beans. The third egg had been found by a hungry squirrel sometime during the night. Luckily, my son thought that is was funny that squirrels also liked jelly beans so no tears. Fourth and fifth eggs were quickly spotted and placed in his basket. But the sixth egg – which I had skillfully tucked between two pine cones under our tall pine tree – was nowhere to be seen. Obviously another rogue nocturnal visitor had grabbed that one because it took us for-ever-er to hunt that thing down. Needless to say, I was much more careful the next time we decided to do an outdoor egg hunt! You'll need a few things for a great egg hunt! In addition to some creative ideas to try, we're also including affiliate links for fun items for your Egg Hunt too. This will obviously depend on the size of your group, the number of eggs you want to hide and also the weather! Be sure to see our detailed post & printable clues for an Outdoor Egg Hunt. Have a back-up plan for outdoor hunts just in case the weather gets bad. Be sure all kids have a basket or bag to hold their found eggs - here are a few cute ideas if you're looking for Easter-themed tote bags! And if you have a really big group, you might let the young ones hunt first and then the older kids. 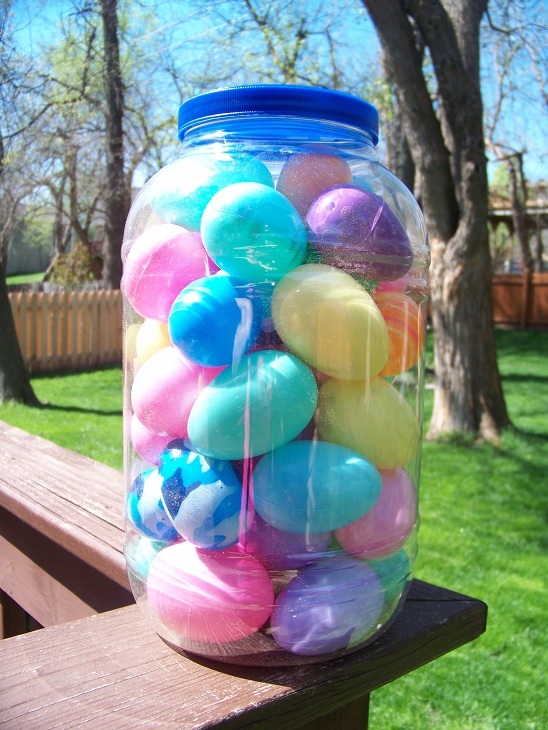 Or plan to hide eggs by color (for example -- pink & green for kids under 7 and yellow & blue for kids 8 and up). Do Kids need Clues for the Egg Hunt? This is always a consideration -- should you have a set of clues leading to the eggs? Or should you just hide them and let kids search everywhere until they are all found. We like to do both! Who said Easter only allows for one egg hunt, right?! The Easter Bunny always hides eggs at our house and our kids have to search for them without any clues. But when I hide eggs, usually filled with some coins or fun little items like Easter stamps or Easter-themed Mad-lib puzzles, I give them some clues. Whether you're planning a neighborhood Easter egg hunt or gathering the cousins at your house for the holiday, we have a variety of both indoor & outdoor egg hunts to try! 1. Easter Egg Hunt with FREE printable clues - easy indoor egg hunt that works in any home with kids of all ages! 2. Lego Easter Egg Hunt Mini Figure Surprise - great for Lego-lovers! 3. 5 Fun Active Learning Egg Hunt Games for Siblings - get kids to burn off some energy. 4. Easter Egg Hunt Map Reading - for anyone who loves maps! 5. DIY Dinosaur Eggs: Hunt & Hatch - perfect for those mini-paleontologists. 6. Easter Egg Scavenger Hunt with Picture Clues - great for toddlers & younger kids! 7. Tips for Planning a Neighborhood Easter Egg Hunt - lots of ideas if you're hosting a crowd! 9. Easter Activity: Hunting for Animals that Lay Eggs - wonderful activity for nature enthusiasts! 10. Plastic Egg Hunt Letter Recognition - another fun learning hunt that would be good in a classroom. 11. 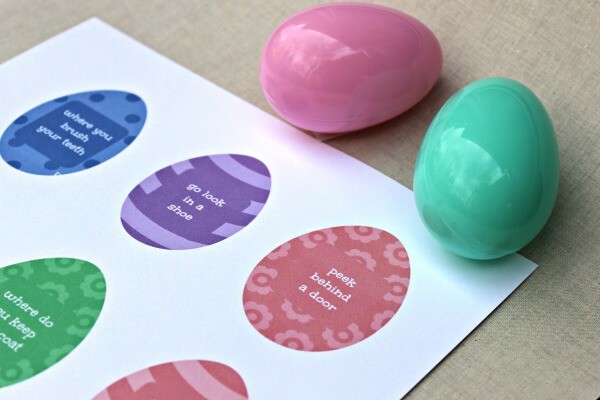 Printable Easter Egg Hunt - for toddlers & preschool kids to do at home. 12. Outdoor Easter Egg Hunt - an enjoyable one for an Easter celebration on a nice day! Need ideas for egg fillers? 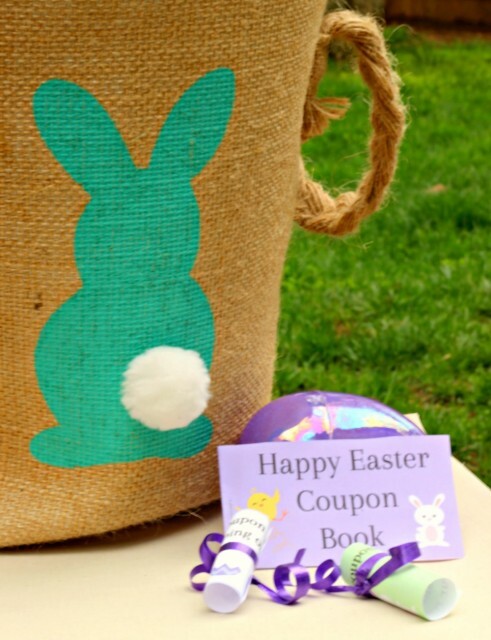 Check out these Easter Activity Coupons for Kids & Teens too! 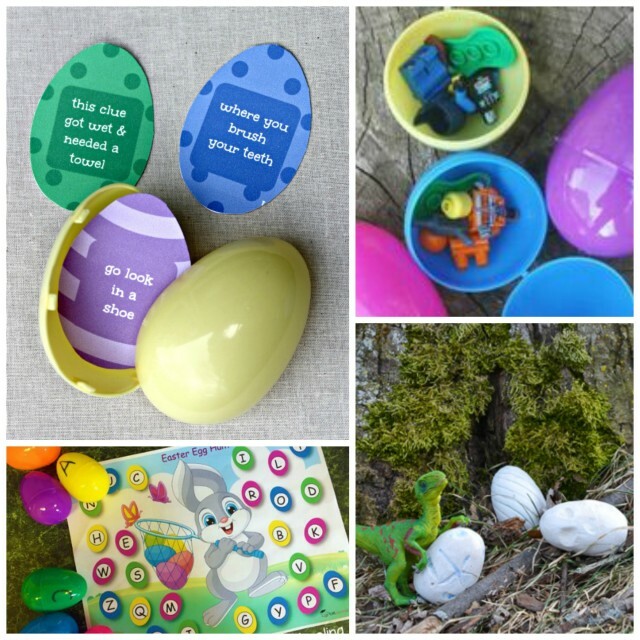 DIY Outdoor Egg Hunt with printable clues!